Life at Barry University in Miami, Florida, offers exciting learning opportunities and so much more.You intern at a multinational company. You work with professors. You study by the pool on a 122-acre campus linedwith palm trees. You chat with an author or CEO after a lecture. You cheer on one of our championship athletic programs like tennis, volleyball, or rowing. You spend Saturdays with friends on South Beach. You learn how to scuba dive. You make a difference. By living in the international city of Miami and learning with students from around the world, your collegeexperience will be anything but typical. As a student, you’ll quickly realize that Barry offers far more than classrooms and tests; learning comes from everything around you. 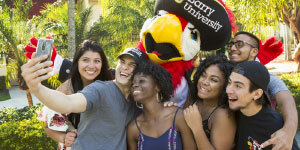 Barry offers more than 100 majors and specializations and many opportunities to deepen your education. The Honors Program engages you with classes in culture and philosophy. You study abroad in Germany and learnabout business practices in the European Union. You earn your master’s degree with just an extra year of study—Barry offers seamless five-year bachelor’s-to-master’s programs, including Education, Sports Management, and Social Work. No matter what path you choose, you gain hands-on experience before you graduate. You help produce a television show during an internship at MTV Latin America, one of more than 700 multinational companies in Miami. You present your research findings at a national conference. You analyze development opportunities in a low-income neighborhood. You analyze public health in Jamaica and share your insights with government officials. You apply what you’ve learned in the classroom to a rapidly changing world. What’s more, Barry has a 13:1 student-faculty ratio, so you learn in small classes and receive personal attention from your professors. They not only know your name, but they also know your goals and will help you reach them. Barry enrolls 7,500 students from nearly all 50 states and 80 countries. This diversity of cultures and perspectives enriches your college experience. At Barry, you do more than advance your career; you learn to make the world a better place. Barry’s Center for Community Service Initiatives fosters partnerships with community organizations, so some of your classes use service learning to integrate your course work with community needs. You work with at-risk teens and help them see the world through a different lens. You help migrant farmworkers advocate for fair treatment. You give the gift of shelter to a deserving family with Habitat for Humanity. As a Barry student, you express yourself—after all, there are more than 60student organizations to choose from.Best of all, you develop leadership skills and make lifelong friendships at the same time. You dress for Carnaval at the annual Festival of Nations. You become part of the International and Multicultural Programs to form relationships with global agencies. As a student at Barry, you discover more about the world and embrace the rich cultural diversity. You also support—or compete on—one of Barry’s 12 varsity teams. A member of the NCAA Division II Sunshine State Conference, the Buccaneers field teams in baseball, basketball, golf, rowing, soccer, softball, tennis, and volleyball. The Buccaneers have won 19 NCAA national championships. With all that it has to offer, Barry strives to provide the resources to make your education—and college experience—affordable for you and your family. 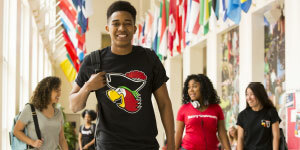 Through scholarships, grants, work-study programs, and low-interest loans, more than 90% of all undergraduates receive some form of financial aid. Ready to live a Barry life? Contact us to schedule a campus visit or speak to an admissions counselor.